Eight months ago Ms. Nguyen Thi Dieu Linh was promoted to Norwegian People’s Aid (NPA) Operations Manager at Project RENEW in Quang Tri Province. The 32-year-old is the first woman to be selected for this position in Vietnam. Linh now manages 160 technicians and support staff who make up 26 teams that are deployed every day. Team members map confirmed hazardous areas for clearance and provide EOD response to safely dispose of cluster munitions and unexploded ordnance throughout the province. Linh spoke with Ngo Xuan Hien and Chuck Searcy. Q: Few NGOs, in particular mine action organizations, have women in charge of such large and specialized, technical programs. Is this significant, or do you see this as just another job to do? LINH: This job is a big opportunity and also a big challenge for me. I took the job when the project got three times bigger than before after we received huge new funding from the U.S. Department of State to expand our operations into all of Quang Tri Province. So it is not easy for me, there is a much greater workload and high expectations. I have had to try really hard for the last eight months. However, success cannot be achieved by an individual, but by a team. Everyone is important and has her or his own contribution to make to the success of the project. I’m just a link in the chain, and we are moving forward. Q: At this time there are around 160 staff working for you, and most of them are men, right? LINH: Most are men, yes. About 23% of the total operations staff are female. Before we had only men working as searchers, but during the last two to three years, we have started to recruit women to work in the field. Q: Many foreigners don’t know much about Vietnam. They are surprised when they learn that over the centuries, there have been some very strong leaders in the nation’s history who were women. That’s something that every Vietnamese child learns in school, isn’t it? LINH: I believe everyone is aware of the importance of women in our history, and nowadays women are assuming important roles in every field, in politics, economics – in every field there are more women in leadership. Women are stronger than ever, more independent. However, in certain roles, women have to try harder, to prove themselves. LINH: It’s not fair, but I understand how some people see it. For a woman to take an important job in the workplace, with more responsibility than a man, and to be a good mother, a good wife at the same time while doing the job well – it’s considered a challenge. 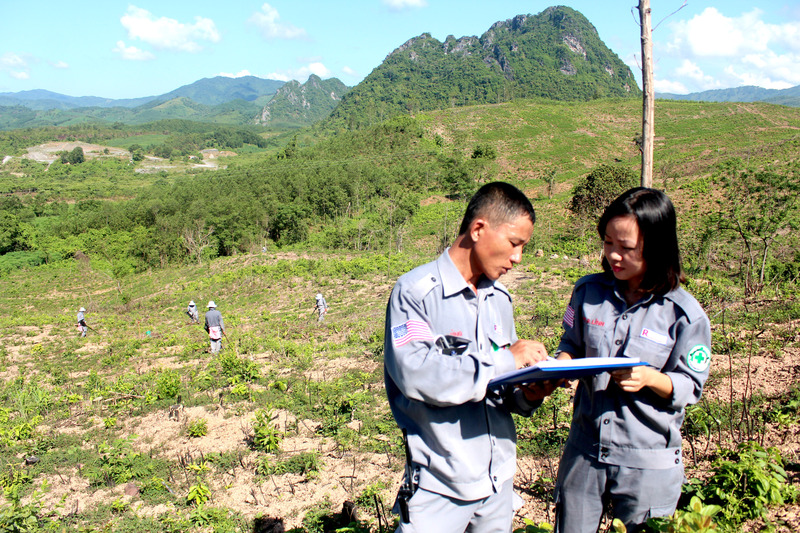 Q: In your job as manager of a very large technical demining operation you’re helping residents of Quang Tri Province to save lives, to reduce accidents and injuries, by cleaning up bombs and mines. But it is – or it could be – very dangerous work. So far it has not been, since Project RENEW / NPA teams have never had an accident or injury. You are obviously very careful, and safety seems to be a top priority for all your teams. Do you ever worry about the danger? LINH: Safety is always our number one priority. We always work in accordance with the highest international standards and the best available procedures, and everyone is trained in accordance with International Mine Action Standards. In addition, we strongly maintain discipline among our team, we work safely. Q: Would you say that you’re now an expert concerning unexploded ordnance found in Quang Tri Province? You don’t need to be modest. LINH: I don’t see myself as an expert and I cannot say that I know every item. However, I was trained at a high international standard, “IMAS EOD Level 2,” by Norwegian People’s Aid. I also have many experienced Team Leaders and technical experts on the staff who are qualified as IMAS EOD Level 2 and Level 3. They are cleaning up dangerous items on the ground on a daily basis. Q: You have benefited from years of working experience with highly skilled technical experts, including Col. Hong, senior advisor to Project RENEW and a Vietnamese veteran with wartime experience, and representatives of international organizations such as Norwegian People’s Aid (NPA). LINH: Yes, I’ve learned a lot from Col. Hong, experienced team leaders, and international colleagues. They have played a very important role in building capacity for local staff. Thanks to this capacity building from international colleagues, especially NPA in recent years, the Vietnamese staff at Project RENEW are now able to conduct, supervise, and coordinate all field activities by ourselves. This is a big jump forward. Q: Do you have any problem balancing your work, your professional responsibilities, and your family obligations? You have one child? LINH: One daughter, yes. I’m very lucky that my husband is very supportive, so we cooperate in sharing the tasks of taking care of my daughter, and he always supports me in every way and says, “Don’t worry, do what you have to do, I will take care of things at home.” Of course I always try to balance so I can have time for my daughter and my family. Q: Can you foresee a day in the future when people in Quang Tri are confident that they can live safely, without fear of bombs and mines? Are people now safer because of the work you do? LINH: After about five or seven years more, I believe that Quang Tri people will have a much safer life. There will still be some random items that roving teams and military must take care of, but highly contaminated areas will be cleared, people can use the land safely and people know what to do when they encounter random ordnance. Q: You have met many visiting delegations, foreigners, some of them very surprised that NPA / RENEW is receiving huge financial support from the U.S. government. And now the current five-year plan is supported with U.S. funding. What do you say when someone asks you about that, the fact that you’re receiving money from the U.S. government? LINH: People realize that the problem we’re solving here is because of the war between the U.S. and Vietnam. And now the U.S. is willing to face their responsibility, and cooperate with us to resolve the problem. As everyone says, the war is over, and we have to think about the present and the future. We cannot always think about the past. Q: Over the years you’ve worked with a lot of American veterans. U.S. vets are sometimes surprised that the Vietnamese people are very forgiving, very willing to work with American veterans and organizations, and the Vietnamese often thank former Gis for coming back and helping to deal with the consequences of the war. Why do Vietnamese have that attitude? LINH: I can’t say why, but it’s true. Most of Vietnamese treat all people from around the world the same. We meet them on the road and we help each other, we don’t have any feeling of hate toward foreigners or former enemies. Q: Did you have any members of your family who fought on opposite sides during the war – for the People’s Army on one side, and for the ARVN on the other, the military of the Saigon regime? LINH: Yes, some in the war on all sides. Some were wounded, they suffered injuries on every side. Today everyone is reunited, there is no problem. Q: Can you share with us about how the government and mine action community are doing in Quang Tri province right now? LINH: Quang Tri right now already has established its Legacy of War Coordination Centre and Database Unit. They are supporting and working very closely with all mine action operators in the province. Now we are all linking together, sharing information with each other, and discussing together as a team about ways to do things better. Before, we were separated by districts, and different organizations had different information systems and methodologies. Now, for the first time, mine action organizations are working together to conduct a systematic approach and implement a joint plan province-wide. With funding from U.S DoS, NPA is conducting a Cluster Munitions Remnants Survey with Project RENEW to map out all confirmed hazardous areas (CHAs) in the whole province. Then Mines Advisory Group (MAG) is clearing these dangerous areas and handing over safe land to the local community. At present, Peace Trees Vietnam is also clearing some of the CHAs. After all CHAs in the province are identified and mapped, we will then convert our survey teams into clearance teams also and finish the job. Q: Thank you very much, Linh. Good luck with your work, and with your important responsibilities. LINH: Thank you so much, Chuck and Hien, for spending time with me. On this occasion, I would like to thank my dear colleagues at Project RENEW and Norwegian People’s Aid for being so supportive and cooperative, making my job so much easier. I also would like to thank donors and partners, especially the US DoS, for joining hands with us to try to solve this problem.